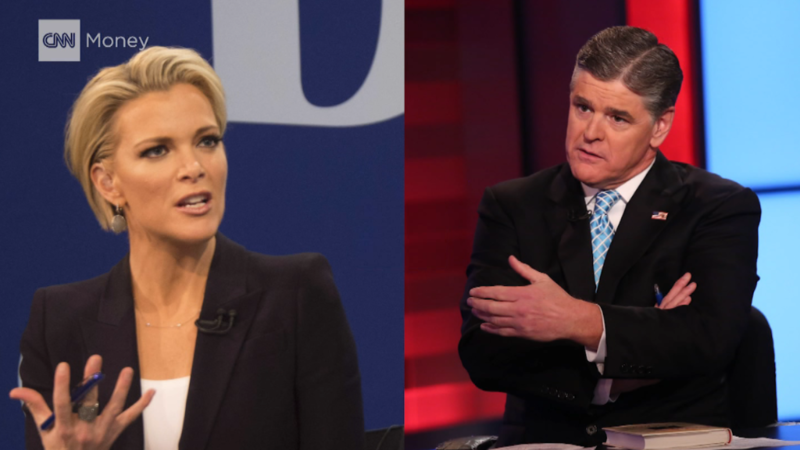 Fox News primetime hosts Megyn Kelly and Sean Hannity appear to have made up after a public spat over Donald Trump. Both hosts tweeted a photo of themselves sitting together in the Fox News studios with their arms around one another. "We're Irish. It's complicated. #friends," their tweets read. The dust-up began on Wednesday night when Hannity, an outspoken Trump supporter, criticized Kelly for saying that Trump only spoke to friendly interviewers such as himself. "Donald Trump, with all due respect to my friend at 10, will go on Hannity, and pretty much only Hannity, and will not venture out to the unsafe spaces these days, which doesn't exactly expand the tent," Kelly had said. "u should be mad at @HillaryClinton. Clearly you support her," Hannity tweeted at Kelly. In fact, Kelly is a nonpartisan journalist, and she had criticized both Trump and Hillary Clinton for only speaking to sympathetic interviewers. While Hannity alone is responsible for his attack on Kelly, the fact that their discord spilled into public view suggests a lack of order following the ouster of Roger Ailes, the former chairman and CEO who resigned amid sexual harassment allegations. Ailes was able to manage such disparate talents, but since his departure in July the tension between Kelly and Hannity has grown increasingly apparent. Perhaps that is to be expected given that Hannity is openly supporting a candidate who spent several months publicly attacking Kelly. Whatever the case, the two appear to be on speaking terms again. Signing off on Thursday night's show, Kelly introduced Hannity, whose show comes immediately after hers, as "my friend."